Targeted Direct Mail Campaign-Beasley Direct and Online Marketing, Inc. Platinum Software was an enterprise-class, network-based accounting software package. 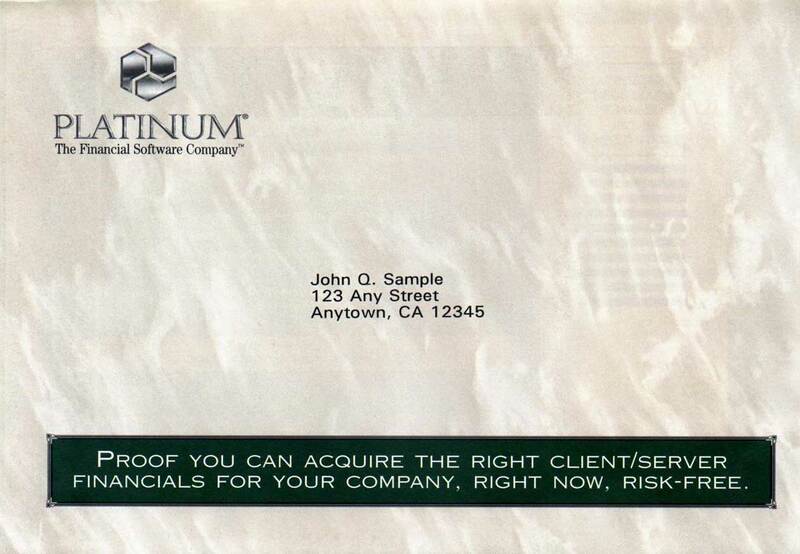 The task in this targeted direct mail campaign was to convince CFOs that Platinum (now Epicor) could do everything their PC-based systems could do, and better. We knew they needed proof, so we offered a free “conference room pilot” where a sales rep would literally go to their office and create all of the same types of reports they needed right there on the Platinum platform. This campaign proved to be a very effective door opening campaign for Sales. Do you need a highly targeted direct mail campaign that opens doors? Call and speak with a Beasley direct mail expert now.